All small businesses are constantly balancing the necessity of keeping their office technology at a high level while keeping within tight budgets. As a result, companies need to frequently assess the state of their business technology to see whether they need minor or major IT adjustments to remain a leader in their industry segment. An important part of understanding your current IT strengths and weaknesses is completing an accurate accounting of all your IT assets. Your company’s IT inventory should include the following items with accompanying purchase and installation dates: servers, hardware, software, warranties, licenses, operating systems, permissions, backups, communication systems, and any other essential items related to IT. Armed with this inventory, you and your trusted IT Support partner can then match up the warning signs described below with the current IT state of your company. With this combined knowledge, you can work together to effectively determine your next steps. The following list details some clear signs that your company urgently needs to update its current IT state. A troubling sign is when part or all of your operations are taking more time and costing more money. You will notice employees spending too much time waiting for their systems and solutions to start up, process data and perform necessary tasks. There will likely be an increase in system crashes as well as employee complaints about the speed and functionality of their IT tools. There might also be a range of manual and mundane tasks that can easily be automated or improved with new solutions. Your company should listen carefully to employee feedback on all your technology assets as they are your best resource. A good rule of thumb used by Network Depot is that servers should be replaced at least every 5 years and all hardware and software and other IT components should be evaluated every 3-5 years. Some technology components can work well longer, but age is a factor that will eventually win out every time. 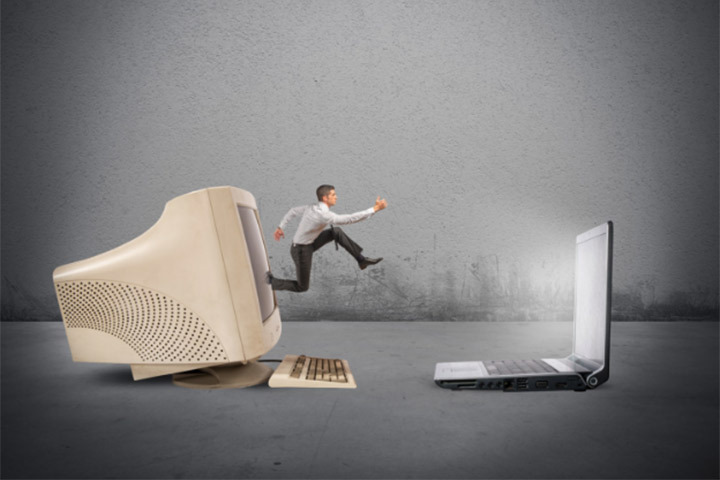 Often your technology will still work fine on its own, but will not be compatible with newer technology or the IT used by clients or partners. It’s an embarrassing problem when your employees are constantly finding that their IT is inferior when working with clients and partners. This negative image reflects poorly on your company and can cause a loss of confidence and, ultimately, result in a loss of business. IT shortcomings in comparison to competitors will lead to difficulty winning new clients and will also create problems for client retention. Companies will notice that their employees are becoming frustrated by the speed and functionality at their workstation in comparison to their technology used at home and on their mobile devices. Addressing this deficiency is even more important when a company makes the decision to take advantage of remote working opportunities for its employees. When your business grows your technology must grow with it. With greater size comes increased data and processing requirements. As your company strives to maintain control over new clients, employees, and services, you will need to add the latest superior tech tools. For example, your company could investigate new customer relationship and employee management software, an improved phone system, and the purchase of new software and hardware. Don’t make the critical mistake of seeking out the easiest and cheapest solutions for your IT needs! Even though they may be cheaper or easier to purchase, a company must carefully research and consider other important factors such as the implementation time frame (including training time for employees) and the overall functionality of the solution. The increasing movement toward cloud computing options must also always be considered when you are assessing your desired future IT state. A consultation with an IT Support expert can reveal if your company needs to make small or significant changes to your current IT situation. Modest improvements could include adding new memory to servers and devices or updating software. Necessary major changes could include software upgrades, new digital communication systems, and the purchase of new servers and other hardware. When noticing any of the key warning signs described above your company should seek the advice of a respected IT Support professional such as Network Depot. Your trusted IT partner will effectively evaluate your current IT situation and will recommend the minor or major changes necessary to best upgrade your technology tools. For assistance assessing the current state of your company’s technology and any other IT-related issues, please contact us here at Network Depot.